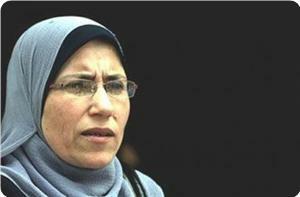 Palestinian lawmaker Samira Halayka said that de facto president Mahmoud Abbas is paving the way for official Palestinian recognition of Israel as a Jewish state, affirming that such recognition would not stop the Palestinian people from resisting the occupation. "If the occupation authority went to the UN to get recognition of its Jewish state, as Abbas had suggested, it will not face any difficulty in getting what it wants because the position of the international community and the UN towards it is well known, not to mention the international pressures that would be made by the Jewish lobby to achieve this end," MP Halayka stated in press remarks to Quds Press on Sunday. The lawmaker strongly denounced Abbas for dominating the Palestinian decision-making with no regard to the presence of an elected body represented by the Palestinian legislative council. She said that the Israeli occupation's insistence on Palestinian recognition of a Jewish state confirms that the conflict in Palestine is a religious war between Muslims and Jews. For his part, Palestinian lawmaker Ibrahim Dahbour warned that Mahmoud Abbas would condemn his authority to death if he dared to recognize Israel as a Jewish state. "If any Palestinian leadership tried to waive the Palestinian constants, it would condemn itself to death at the hand of its own people," MP Dahbour told Quds Press. He also warned that If Israel managed to get such recognition through the UN, the Palestinians would get into a dark tunnel where there is no escape from, and their right of return would vanish. The lawmaker added that the Israeli occupation would also expel the Palestinians from their homes and towns in the 1948 occupied lands if its Jewish state was recognized. Israeli government is in the process of legalizing the status of the illegal settlement outpost Avigayil founded in 2001 on more than 1,000 dunums (250 acres) of lands of al-Khalil Hills, Israeli sources revealed on Monday. Haaretz Hebrew newspaper said that Avigayil outpost is located between the Maon and Susiya settlements. Demolition orders issued against Avigayl since its establishment in 2001 have never been enforced, according to the paper. Avigayil was one of 26 outposts that then-Prime Minister Ariel Sharon promised in 2003 to evacuate as part of the Road Map, the sources added. “The official combined area of the legal settlements in the area, excluding Ma’on and Avigayil, is 10,180 dunums.”To the east of the bloc is a 30,000-dunum Israel army firing range, from which the war ministry is trying to remove eight Palestinian villages. 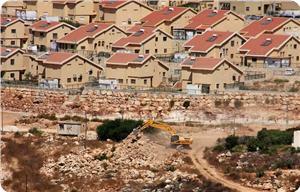 The Israeli government is seeking a High Court of Justice backing to raze the villages, according to the report. Israeli War Minister Moshe Yaalon has visited the mentioned settlement in December 2013, where he declared his government's intention to legalize the outpost. Haaretz said that "the gradual expansion of the settlements’ residential and agricultural areas has been accompanied by regular, well-documented efforts by settlers to block the access of Palestinian farmers and shepherds in the area to increasing portions of their land." The report said that the numerous closure orders issued by the Israeli army for the area also limit Palestinian access to their land. Atwan: Kerry's plan based on the recognition of the "Jewishness of Israel"
Renowned journalist Abdel- Bari Atwan said that US Secretary of State John Kerry's plan is based on the recognition of the "Jewishness of Israel and Jerusalem as its capital city". According to leaked documents, Kerry's plan clearly compromises the Palestinian refugees' right of return (RoR), Atwan, the London-based Palestinian journalist, said during a seminar organized by Engineers for Palestine and Jerusalem Commission in Amman. Atwan noted that the "Jewishness of Israel" plan followed the failure of the one-state solution's plan, adding that the plans aims to expel one and a half million Palestinians from the territories occupied in 1948. Kerry's plan stresses the right of 80% of West Bank settlers to stay in their settlements while retaining their Israeli nationality, he added. Atwan pointed out that the Israelis are working "to criminalize criticizing the Jewishness of Israel in Arab and western laws through linking it to anti-Semitism." They are aiming to abolish Arab rights in Palestine particularly the right of return, and to prevent talking about the destruction of Israel and about RoR and resistance, he added. He pointed to the Arab lack of interest towards the Palestinian cause, saying that boycott of Israel campaigns had diminished. He linked the Israeli occupation to Palestine with the current events in Iraq, Syria, and Egypt, stressing the need for an Arab firm position towards the escalating attempt to liquidate the Palestinian cause. 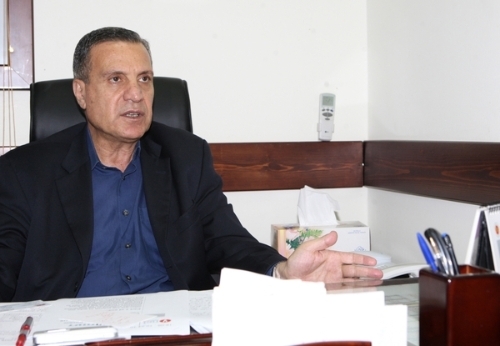 For his part, head of the Federation of Arab Engineers (FAE), Abdullah Obeidat, said that US administration and Israeli authorities aim to preoccupy Arab states with their internal problems and disagreements in order to distract Arab attention away from the Palestinian issue. He stressed the FAE determination to continue defending the nation and Palestinian cause particularly Jerusalem and Al-Aqsa Mosque issues, warning of Israeli schemes and threats. For his part, Palestinian Legislative Council second deputy speaker Hassan Khreisheh considered PA chairman Mahmoud Abbas's bet on UN refusal to recognize Israel as a Jewish state as an unrealistic approach and an attempt to provide free solutions to Israel. He said that in light the current situation in the region Israel could easily obtain an international recognition of its Jewishness and therefore the Palestinian recognition would be a fait accompli. Wadi Hilweh Information Center revealed last Tuesday a new settlement project under the name of “Tourism Center in Ma’yan Hagionl” in the national park and near the City of David. The project will be implemented in the eastern side of the neighbourhood of Wadi Hilweh south of Al-Aqsa Mosque. The Center was informed that the project will be implemented in the area of “Al-Ein” at the bottom of the neighbourhood of Wadi Hilweh on an area of 1200 square meters. It will consist of two floors and is called Beit Al-Ein and a museum about the Jewish history will be established which is a continuation to the “Kedem” project that is projected to be built at the entrance of the neighbourhood which is the area named “National Park” around the walls of Jerusalem. 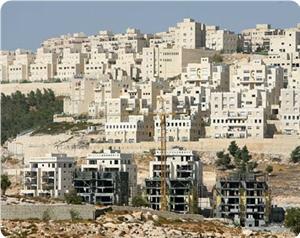 The Center pointed out that the project is governmental and is under the supervision of “Elad” settlement organization. The Jerusalem municipality announced that Al-Ein area will be changed from a public and open space to private; note that this area is designated for excavations for antiquities and a visitors’ center will be established underground. The occupation municipality distributed in the last few days flyers to seven families in Al-Ein area to inform them of the project to be implemented on their lands and gave them 60 days to object. These families live in 22 residential apartments on an area of 5 Dunoms and they are: Abbasi, Abu Mayaleh, Abu Sbeih and Abu Sneineh. Lawyer Sami Arshid said that he will be submit an appeal in the name of those affected from confiscating their land and pointed out that those lands are private properties of Jerusalemites. The Center confirmed that the settlement project will cause damages to the neighboring houses and properties in addition to the confiscation of wide area of land. The local organizing committee in the municipality requested anyone affected by the project to submit an objection within 60 days to the local committee in Jerusalem. According to the flyer, any objection should be handwritten and has an explanation of the reasons in order to be considered. The center denounced the racist settlement schemes that threaten the Arab and Islamic identity of the neighbourhood near the southern wall of Al-Aqsa Mosque and pointed out that Elad organization lately confessed that the Jewish history doesn’t have any roots in that area. Wadi Hilweh committee appealed for the Palestinian Authority since it is a permanent member of the UNESCO and quickly react and prevent the implementation of the settlement projects especially that the international laws prohibits changing that historical and archaeological monuments in an occupied state. Eyad Abbasi, one of those affected, explained that the municipality crews handed him along with six other families a notice regarding the settlement project which will be implemented on his land. Abbasi explained that the settlers tried several times to buy the 2-Dunom land from his family for a large amount of money and “outrageous” offers. After failing to reach a deal, the land was classified as “green” and today they are trying to confiscate it and build a settlement project. With just two months to go before the deadline expires for reaching a framework that would enable the continuation of US-brokered Israeli-Palestinian peace diplomacy, the two sides seem as far apart as ever on the core issues of their dispute. This, despite 10 trips to the region by US Secretary of State John Kerry, who in June announced the resumption of negotiations after three years in which there were no contacts. Initially, Mr Kerry said the goal was to reach a full-fledged end of conflict accord within nine months. But he subsequently scaled that down to a framework agreement to enable further talks by the end of April. In recent weeks, as noted by leading Israeli analyst Yossi Alpher, Mr Kerry has backtracked further, putting the goal as a document which the sides do not have to endorse as long as they do not reject. 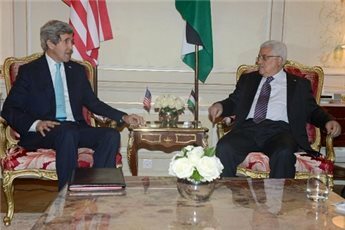 The latest diplomacy by Mr Kerry, in which he met twice last week in Paris with the Palestinian President Mahmoud Abbas, has left the Palestinian side disgruntled and pessimistic, in part over Washington's embrace of Israel's demand that the Palestinians formally recognise the Jewish character of the Israeli state, a condition that was not required of Egypt and Jordan when they signed peace treaties with Israel. "What Kerry has been doing with the framework is taking the arguments of Israel and trying to present them to the Palestinians,'' said Abdullah Abdullah, deputy commissioner of international relations for Mr Abbas's Fatah movement. ''We still hope he will review his ideas and come up with something that is fair." Mr Abdullah said Mr Kerry's ideas do not until now include Israeli recognition of a Palestinian capital in the area that was Jordanian Jerusalem until the 1967 Middle East war, when Israel captured East Jerusalem along with the rest of the West Bank. The Palestinians also object to the continued presence of Israeli soldiers in the strategic Jordan Valley area of the West Bank. ''Any Israeli soldier left in the Palestinian state means the occupation hasn't ended,'' Mr Abdullah said. Israel, meanwhile, does not accept that the borders between Israel and the Palestinian state be based on those that prevailed between Israel and the West Bank before the 1967 war. And pro-settler elements within Prime Minister Benjamin Netanyahu's coalition have voiced alarm at reports that Mr Kerry's framework document will include a freeze on building in isolated settlements in the West Bank. But it is the Jewish state demand that appears to be raising the most Palestinian ire. Mr Abdullah says that accepting it would harm the status of Israel's Arab minority, which makes up twenty per cent of the population and is supposed to enjoy equal rights. ''If we do this, they will be aliens and can be thrown out at any time,'' he says. Accepting the demand would undermine the Palestinian ''right of return'' to places of origin inside Israel, something Kerry has passed over but which the Palestinians still insist on, he says. One prominent Palestinian, Nabil Amr, the former ambassador to Egypt, has attracted criticism from other Palestinian politicians by appearing to show some flexibility on the Jewish state demand. ''It is impossible to accept this issue as Netanyahu explains it, but the Americans can find some new formula,'' he told The Independent. 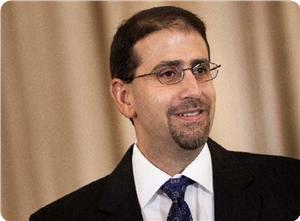 The US ambassador to Israel, Dan Shapiro told Israel Radio on Friday that he expects Palestinian recognition of Israel's Jewish character to be part of the framework agreement. ''It has always been US policy that Israel is a Jewish state and should remain a Jewish state,'' he said. Over the weekend Palestinian scout troops in Nablus, Jerusalem, Syria and Lebanon organized a unified event to rally Palestinians on key issues of national concern. The event was organized by the Palestinian Scouts' Association in cooperation with the Yafa Cultural Center in Balata refugee camp. Palestinian Scouts' Association said in a press release Monday that it was the first time Palestinian scouts have gathered across borders in a forum, and included scout marches and messages of solidarity and unity with Palestinians in Syria. The events were connected via video conference to affirm the unity of all Palestinians everywhere in the struggle for liberation and return. Under the banner: "Scouts Lead the Way, The Camp is Our Address, Return is Our Choice", activities were organised in Balata refugee camp in Nablus, Shu'fat camp in Jerusalem, Ein al Hilweh camp in Lebanon and Yarmouk camp in Syria. They brought together troop leaders and national figures calling for an end to the siege of the Palestinian camps in Syria, and asserting the demand of Palestinians everywhere for the right of return. The calls explicitly rejected any proposals, such as resettlement and secondary displacement, all which renege on the right of all Palestinians to return to their homes of origin, in accordance with international law. The events highlighted the unique role that scouts have historically played in the Palestinian national movement, both in Palestine and the Shatat (exile). Evoking this tradition, the scouts rallied Palestinians around a unified national position adhering to the right of return. Coordination of these events represented the unity of Palestinian scout groups, alongside other Palestinian popular organisations, in steadfast rejection of any and all schemes that would dissolve Palestinians' demand to return. After playing the national anthem and a moment of silence for Palestinian martyrs, Muhammad Jamil Sawalmeh, the head of the Palestinian Scout Association in Palestine, began the programme of events with a few words on the history of the Scouts' movement in defending Palestinian national principles, particularly the right of return. He explained how the activities and educational programmes of the scouts had maintained the Palestinian culture of return across generations, and he emphasised the unity of the Palestinian people everywhere. On behalf of the Yafa Cultural Center, Taysir Nasrallah, also a member of the Palestinian National Council, emphasised the unity of all the Palestinian people standing shoulder to shoulder with Palestinians in Yarmouk camp. He drew attention to the concerted efforts across Palestinian communities to raise funds, lead marches and campaign on behalf of their people in Syria. Nasrallah further stressed the need for maintaining the camps as the bridge for the return of Palestinians to their homes of origin, which is the only solution capable of ending the suffering of Palestinians. Speaking on the desperate situation of Nayrab and Handarat camps near Aleppo, Nasrallah focused on the 300 families that are being subjected to the brute force of hunger, siege and shelling. 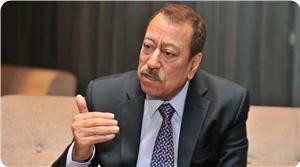 He called for an immediate intervention to put an end to the siege of these camps, and all Palestinian camps in Syria. In Ein Al-Hilweh camp Khaled Awad, the secretary of the Palestinian Scouts Association in Lebanon affirmed the rejection of all projects that target the right of return against the wishes of Palestinians. He also affirmed the solidarity of the Palestinian refugees in Lebanon with their secondarily displaced families from the camps in Syria, calling on their continued support through donations and other means. He also warned that the targeting of Palestinian camps is one of the methods that resettlement schemes are carried out, and therefore must be rejected. From the capital of the Palestinian homeland, in the Shu'fat camp in Jerusalem, the director of the Shu'fat Youth Activities Centre Muhammad Al-Bahri, affirmed the unwavering stand of the people of Jerusalem against its Judaization, and their solidarity with Palestinians in Yarmouk and across all Palestinian refugee camps. The head of the Palestinian Scouts Association in Jerusalem, Maher Muhsin, also declared the solidarity of the scouts in Jerusalem with Palestinians in the refugee camps in Syria, and with Yarmouk camp in particular, as it is the capital of the camps of the Shatat. In Yarmouk itself scouts gathered in front of the Palestine Hospital with signs asserting the "readiness of the Scouts to serve the sons and daughters of Yarmouk through our ordeal", and: "the right of return will always be the principle we hold in our hearts". In response, another scout from Balata camp replied: "I am a refugee from Jaffa, and I live in Balata camp. I demand my right, and the right of my brothers and sisters in Syria and Lebanon to return to our homes. And we are certain to return! Our heart beats with Yarmouk!" 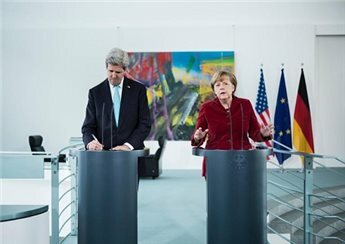 German Chancellor Angela Merkel said Saturday she will fully support efforts by US Secretary of State John Kerry to relaunch the Middle East peace process during her upcoming visit to Israel. "We need, as soon as possible, a stable two-country solution, with a Jewish state of Israel and at the same time a state for the Palestinians," Merkel said in her weekly podcast. "We also support the efforts made by US Secretary of State Kerry (and) I will of course use my stay to bring up this issue with the Israeli prime minister," Benjamin Netanyahu, she added. Merkel, who will be in Israel Monday and Tuesday, recalled that for historical reasons Germany was particularly committed to Israel's right to exist. Palestinian president Mahmud Abbas said Friday that US attempts to forge an agreement on a framework for peace talks with Israel had so far failed but that the efforts are "extremely serious." 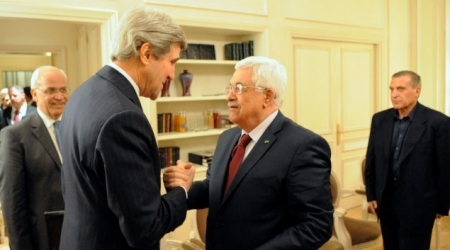 Abbas met with Kerry twice in Paris this week in what a US official described as "constructive" talks. The top US diplomat has spent months trying to get the Israelis and the Palestinians to agree on a framework to guide talks towards a full peace treaty, but the negotiations have shown little sign of progress, with each side blaming the other. Germany and Israel have held regular "government consultations" since 2008, an arrangement where the two sides meet at regular intervals to discuss specific topics. Merkel's visit will be the fifth such meeting between Germany and Israel. The last one was held in Berlin in December 2012. Is Abbas ready to recognize Israel as a Jewish state? PLO Central Committee member Nabil Amr has been quoted as saying that a recognition by the Palestinian Authority (PA) of Israel as a Jewish state is possible in some form. He added, however, that this recognition would need to be approved by a referendum. On Friday morning, American Ambassador to Israel Dan Shapiro told Israel Radio that the "framework agreement" is likely to include recognition of Israel as a Jewish state. It is uncertain if Amr was voicing his own opinion or trying to just test Palestinian public reactions to a possible move toward recognizing Israel as a Jewish state by the PA leadership. The PLO-PA leadership consistently refused to recognize Israel as a Jewish state, citing undeclared Israeli motives behind the "impossible demand." Most Palestinians interpret the Israeli demand as a rabid effort by the Zionist establishment to wrest from the weak Palestinian leadership a recognition or an acknowledgment that Israel has or will have the right to expel Palestinians who are Israeli citizens, especially if and when the Palestinian minority, which constitutes more than 20% of Israel's overall population, poses a demographic challenge to Israel's "Jewish identity." Moreover, the manifestly racist demand does also denote and connote Israel's right to refuse to allow the repatriation of any significant number of Palestinian refugees, violently uprooted from their homes when Israel was established in Palestine in 1948. Unfortunately, the PA leadership seems overzealous to reach a deal with Israel by the hook or by the crook. This is why many Palestinians, including this writer, don't feel that the PA can really be entrusted with the paramount task of safeguarding Palestinian national interests, especially our inalienable rights. True, in peace negotiations, it is often necessary to show a certain degree of good will in order to outmaneuver one's enemy. However, the fundamental issues including the right of return must not be subject to political or diplomatic maneuvers of any kind. 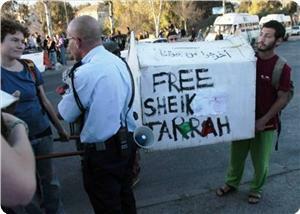 Similarly, Abbas and his leadership have no right to prejudice the national survival of the Arab community in Israel. These people are their own masters and neither the PA-PLO nor the Arab League or the organizations of Muslim states have any right to speak on their own behalf. These people are living in their ancestral homeland and their national existence is an immutable constant not subject to Zionist whims and vagaries. In short, Palestinians across the Green Line are not and must not be used as bargaining chip or negotiation asset by the Ramallah leadership. Some PLO leaders, who follow the adage "feed me today and kill me tomorrow," might be prompted to think that Israel is using this issue of recognizing her as a Jewish state as a mere negotiation tactic to outmaneuver the Palestinians and that in light of this the Palestinians must reciprocate by heeding the Israeli demand if only to deprive Israel of this mantra. However, it would be too foolhardy to think this way because in the final analysis Israel has one strategic goal and that is to liquidate the Palestinian cause. Hence, there is no doubt that the recognition by the PLO of Israel as a Jewish state would be tantamount to committing an act of lewdness with the Palestinian cause. This is why the Palestinian leadership must be warned in the strongest terms against tampering with Palestinian national constants. We must loudly protest any indication suggesting that the PA is about to sell out our inalienable rights in our ancestral homeland. A few days ago, Israeli negotiator and cabinet minister Tzipi Livni declared that Israel as a Jewish state had no future in the absence of peace. This shows that time is not on the side of the Jewish entity. In light, we must not help Israel reclaim a future at our expense just in order to please John Kerry and receive from him a certificate of good conduct. The Israeli weekly Kol Ha'ir said on Friday that the local committee of the Planning and Building approved a plan for the establishment of a religious school in Sheikh Jarrah neighborhood in occupied Jerusalem. The plan includes the establishment of a nine-story building that will be used as a religious school and residences for the school students. The building is scheduled to be constructed over an empty land located behind a gas station on an area of ​​9615 square meters. The plan was approved at the local committee with four votes for and three against. Bibeh Luo, member of the municipal council and one of those who opposed the scheme, said "attempts to turn the Palestinian luxurious neighborhood into a Jewish neighborhood did not succeed, but what is happening will have a negative impact on the ongoing conflicts and the negotiations." Israeli Interior Minister Gideon Sa'ar claimed that Jordan Valley settlements will remain and prosper for ages. “The security of Israel required a strategic depth, it is unthinkable for the border to not be in the Jordan Valley”, he added. According to Israeli Hebrew sources, about 3,000 people, including Interior Minister Gideon Sa'ar and Coalition Chairman Knesset Member Yariv Levin, took part Friday morning in a protest march in the Jordan Valley in support of settlement construction. For his part, MK Levin said during the march “It is our indisputable right to build and be built in the Jordan Valley and all across the land of Israel,” according to his allegations. The Israeli Ministerial Committee on Legislative Affairs approved the bill submitted by MK Miri Regev asking to annex the Jordan Valley. Palestinian Authority President Mahmoud Abbas said Friday that US attempts to forge an agreement on a framework for peace talks with Israel had so far failed but that the efforts are "extremely serious." Speaking in Paris after talks this week with US Secretary of State John Kerry, Abbas told journalists: "So far the Americans have not been able to put these ideas into a framework, even if the efforts are extremely serious." After meeting with Abbas, French President Francois Hollande said he had underlined the need "to reach an agreed framework for negotiations in a timely manner." A Palestinian official, speaking on condition of anonymity, said Friday that ideas proposed by Kerry in Paris could not be accepted "as the basis for a framework accord ... as they do not take into account the legitimate rights of the Palestinian people." Israeli president Shimon Peres said that the US-sponsored peace talks, which are intended to clinch a settlement deal with the Palestinian side, are mainly in the interest of Tel Aviv that seeks Palestinian recognition of a Jewish state. 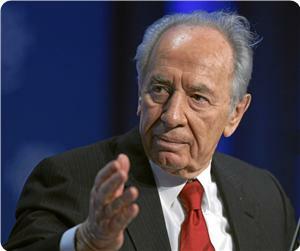 Peres made his remarks on Friday in occupied Jerusalem during his meeting with heads of Zio-American organizations. He stated that the establishment of a Palestinian state are in Israel's favor because the aim of the negotiations with the Palestinians is to keep it as a Jewish state. The president also hailed the US sponsor for its efforts to make a peace deal that protects Israel's interests. US ambassador to Israel Daniel Shapiro had also stated recently that the US-drafted framework agreement which secretary of state John Kerry intends to put forward soon on the negotiating table includes Palestinian recognition of Israel as a Jewish state. PLO Executive Committee member Dr. Hanan Ashrawi Thursday told a visiting J Street leadership delegation headed by its founder and president Jeremy Ben-Ami that Israel is sabotaging the peace efforts. 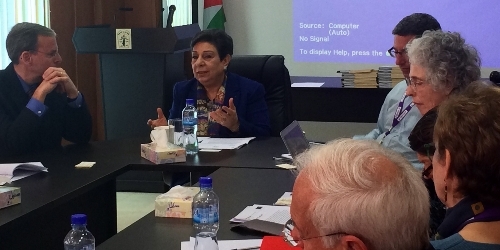 Ashrawi briefed at the PLO Headquarters in Ramallah a delegation from J Street, a liberal American-Jewish lobby group, on the latest political developments, the ongoing negotiations, and Israel's violations of international law and their impact on prospects for peace and on the region. Ashrawi told the delegation, "Israel is willfully sabotaging U.S. Secretary of State, John Kerry's efforts and using the negotiations as a cover to continue with its illegal settlement activities, particularly in and around Jerusalem, and the theft of Palestinian lands and resources, among other violations. "For any agreement to succeed, it has to be firmly embedded in international law, and it must safeguard fundamental Palestinian rights, foremost which is the right to self-determination," stressed Ashrawi. "The Jewish American community, particularly as represented by J Street, faces the dual challenge of influencing both the U.S. administration and the hardline and extremist Israeli government; for there to be peace and stability, we must move rapidly," she added. "For any peace agreement to succeed, it must include the minimal requirements for justice, including the establishment of an independent Palestinian state on 1967 borders with East Jerusalem as its capital, a just solution to the Palestinian refugee question based on UNGA Resolution 194, the cessation of settlement activities and the beginning of the dismantlement of settlements and outposts, and the implementation of the Palestinian people's inalienable rights to freedom and sovereignty," concluded Ashrawi. The Israeli radio said that U.S. Ambassador to Israel Dan Shapiro stressed that the framework agreement, which will result from the Israeli-Palestinian negotiations, will include recognition of the Jewishness of Israel. Shapiro said in a radio interview on Friday morning that the United States has always believed that "Israel" is a Jewish state and must remain so. Palestinian President Mahmoud Abbas' spokesman, Nabil Abu Rudeineh Thursday said that the Palestinians "will not accept any agreement, whether a framework or a final deal, unless it includes the firm Palestinian and Arab positions that are based on international resolutions." 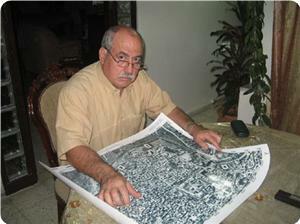 Abu Rudeineh said in a statement to the official Palestinian news agency WAFA that the Palestinian firm position is that there will be no future state of Palestine without east Jerusalem as its capital, the future state must be based on the 1967 borders, that Israeli settlements are illegal, that Palestinian prisoners must be released and that there must be a "just solution" to the issue of Palestinian refugees. Abu Rudeineh also restated Palestinian opposition to recognizing Israel as a Jewish state, a key Israeli demand, according to WAFA. Idwan demands Abbas to resign if he keeps undermining "right of return"
Head of the Hamas's refugee affairs office Isam Adwan called on de facto president Mahmoud Abbas to resign from all his posts if he wanted to persist in his reprehensible remarks on the issue of the Palestinian refugees and waive their right to return. Abbas stated in a meeting with Jewish students last Sunday that he had a creative solution to the problem of the Palestinian refugees and their right return to their homes they had been expelled from in the 1948 occupied lands. After he described the issue of the refugees' return as a problem and said he does not think of flooding Israel with five million refugees and change its social structure, Abbas pointed out, while rubbing his fingers in reference to money, to the possibility of making the refugees feel [financially] satisfied through such a creative solution. "It was not the first time Abbas declared his readiness to relinquish the right of the Palestinian refugees to return. He had already twisted [the UN] resolution 194 in order to hit his target when he said that the resolution calls for either return or compensation," Hamas official Isam Adwan stated. Adwan noted that the number of refugees is about eight million Palestinians and not five million as Abbas kept repeating during his recent meeting with Jewish university students. "Abbas should not have personal opinions because once he took office as a head of the Palestinian authority and the organization (PLO), the smallest details of his life are the property of the Palestinian people. He should be a spokesman for the Palestinian people if he respects them," the Hamas official emphasized. "On behalf of whom does Abbas speak? What is the value of his statements? Are his action, signings and pledges are legal? Abbas can do one right thing for his people through stepping down from his posts, and then he could persist in his personal mind missteps if he wanted so," Adwan added. He also stated that Abbas is no longer a legitimate president of the Palestinian authority because his term of office had expired five years ago, and thus the speaker of the legislative council should have replaced him for sixty days, during which new presidential elections were supposed to be held. Khalil Tokaji, a cartographer and expert on Israeli settlements at the Orient House institution, stated that the Israeli settlement tenders in occupied Jerusalem is part of an Israel systamatic plan to maintain overall control over the city. He confirmed that Israeli settlement schemes dated back to 1994 that aim to establish 58 thousands housing units till 2030 in order to fully annex Jerusalem to Israel. The Israeli authorities are working to escalate settlement construction in order to double settlers' number to reach half a million in Jerusalem and to flood West Bank with a million of settlers till 2030, he added. He pointed out that Israeli plan aims to annex 10% of West Bank in order to expand Jerusalem settlements, saying that Israel does not recognize a Palestinian state on the basis of the 1967 borders. 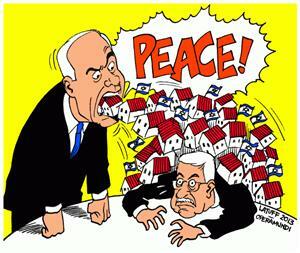 Israeli policy also aims to decrease the Palestinian population in Jerusalem to 12%, he added. He quoted Israeli mayor as saying that 70 thousands of Jerusalemites who live beyond the Wall, northern Jerusalem ad Shufat camp, will be annexed to West Bank and in danger of losing their Jerusalem residency. He warned of the seriousness of Netanyahu's recent remarks regarding the expansion of settlements on religious basis, saying that this plan aims to establish settlers' self-rule in West Bank. Netanyahu is saying that President Mahmoud Abbas is racist since he refuses to accept settler presence in the West Bank. In fact, this is contrary to his strategy that aims to end the Palestinian presence in Jerusalem and the West Bank and to prevent the establishment of a Palestinian state, he said. He pointed out that the number of settlers in the year 1992 was 105 thousand, while today it reached 380 thousand settlers in the West Bank and 250 thousand others in Jerusalem, and added that this increase in the settlers' number is part of an Israeli plan put in 1979 that aims to reach one million settlers in the West and Jerusalem in the year 2030 in order to prevent the establishment of the Palestinian state.